Leonardo da Vinci, without question a polymath and true genius, was also a pioneer human anatomist whose works, which continue to be studied for their accuracy, have been validated by the most modern imaging techniques. Studies of human anatomy had made few advances over the past millennium since Galen, who, unlike Leonardo, did not have access to human corpses. Prior to Leonardo, depictions of the human body focused on its external features with no details of its inner workings, which were verbally, but not pictorially, described. Leonardo was provided access to corpses in Florence, the city of his birth. Starting in 1489, he dissected some twenty to thirty corpses—in good health, diseased, and deformed—over a twenty-year period. He prepared a human anatomy notebook in which he made accurate measurements of the proportions of all body parts, and these were depicted in drawings rendered in multiple views. For the hand and leg, for example, his drawings contained eight to ten layers, with the relationship between the different layers, and their arteries, muscles, ligaments, nerves, and bones portrayed. He meticulously studied and drew different facial expressions to express an entire range of human emotions, and these appear in his most famous paintings. While much acclaimed is his drawing of a fetus in utero, correctly attached to its umbilical cord, his sketches of the female reproductive system contain a number of errors that are said to more accurately represent an animal than a human. Not content with drawings and sketches, he sought to better understand how the body worked. To this end, he prepared physical and mechanical models to simulate the function of body parts, such as how the valves of the heart opened and closed, and used such models in his drawings. Leonardo envisioned that his work would be useful to medical practitioners and planned to publish his anatomical drawings as a treatise on human anatomy. But when he died in 1519, these papers were buried from view among his private possessions. After passing through many hands over the decades, they turned up in the British Royal Collection at the end of the seventeenth century, where they are now housed. SEE ALSO: Vesalius’s De humani corporis fabrica (1543), Placenta (1651). 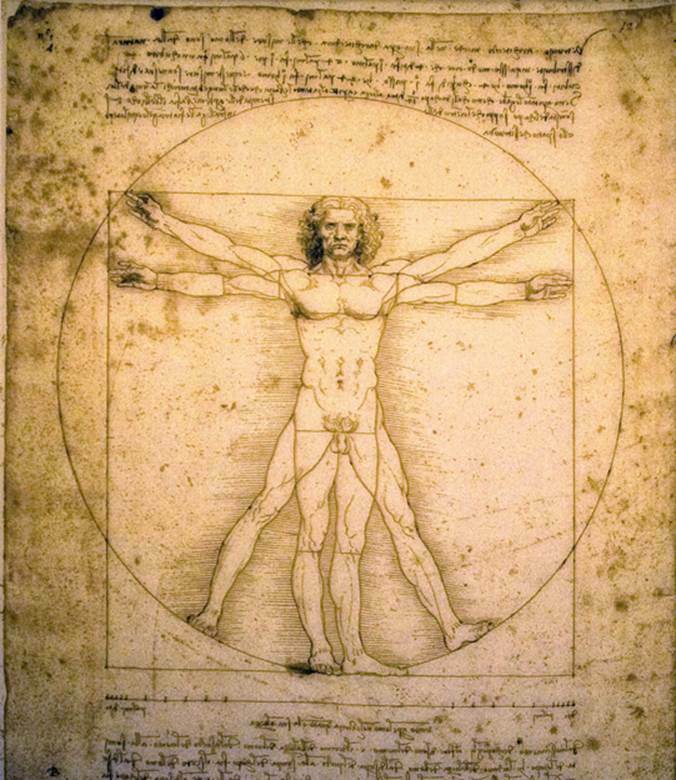 The Vitruvian Man (c. 1490) was Leonardo’s pen ink drawing based on the first-century BCE Roman architect Vitruvius, who believed that the ideal human body could be represented within the perfect geometric forms of a circle and a square.